Earlier in the year, Facebook released their live streaming feature to the masses after first rolling it out to celebrities and a handful of regular users, so it is now a part of everyone's Facebook experience and it is highly likely that you have seen a number of live videos popping up on your news feed from individuals and businesses alike. 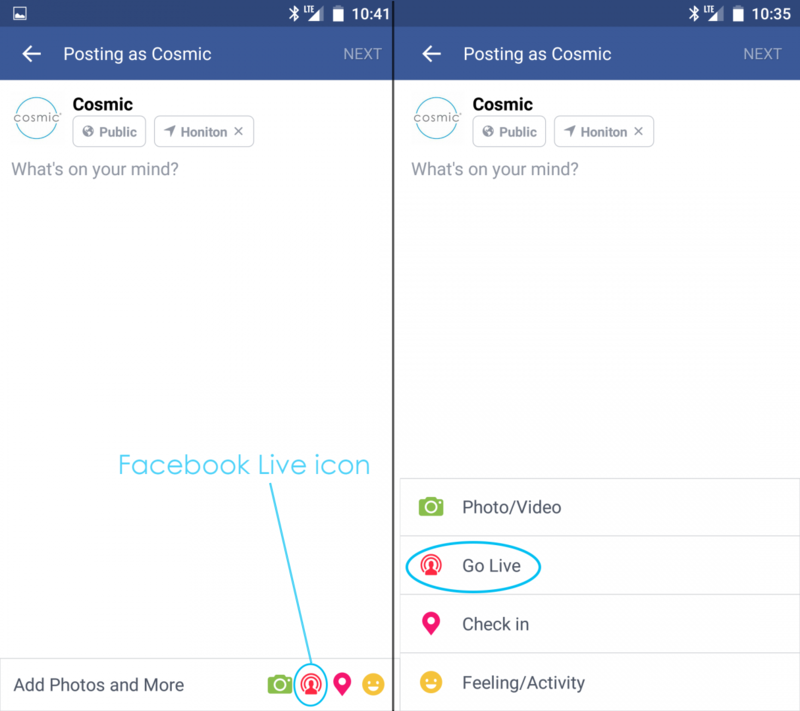 Facebook Live is very easy to use and will have a familiar feel to anyone who has tried Twitter's Periscope. It is a great way of reaching out to an extended audience as video (or visual content in general) always seems to receive far greater engagement compared to text only posts. How do I start a live stream? At the moment, for most users on Facebook, you can only live stream through the Facebook mobile app. Although Facebook are gradually rolling the feature out to desktop users as well it is likely that you won't currently see the option to start a live stream via your desktop browser. 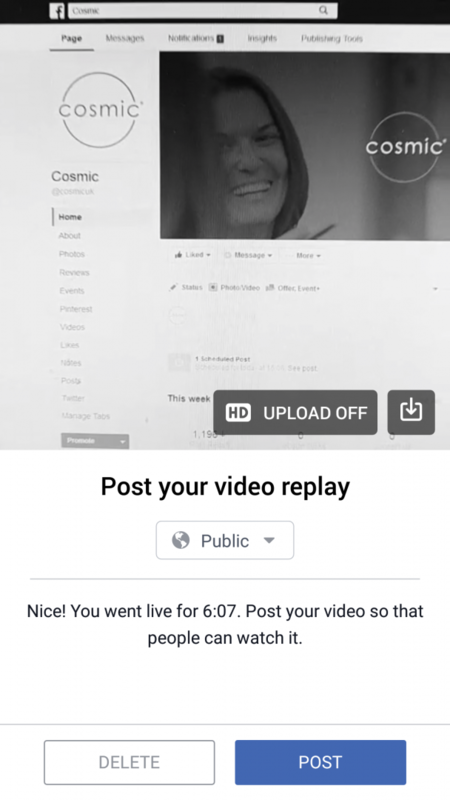 Whilst using the Facebook app, you won’t find a large "Broadcast now" button to start your live video and in fact there is no indication anywhere that you can do anything beyond your traditional Facebook posts. Live stream video is quite well hidden under the status icon. The first step is to go to start writing a new status on Facebook, whether this be on your personal Facebook profile or business page. At the bottom of your status box you will see a new icon that you may not have seen before, along with the add photo/video, check in and feeling/activity options that are there as standard. This new button is the "Go Live" button that will allow you to start a live video. If it is the first time that you are using the live stream feature, then the Facebook app may ask for permission to use you camera and microphone on your device. You will want to allow these permissions unless you want to start a live stream video without video or sound! You should then see a screen similar to the below. 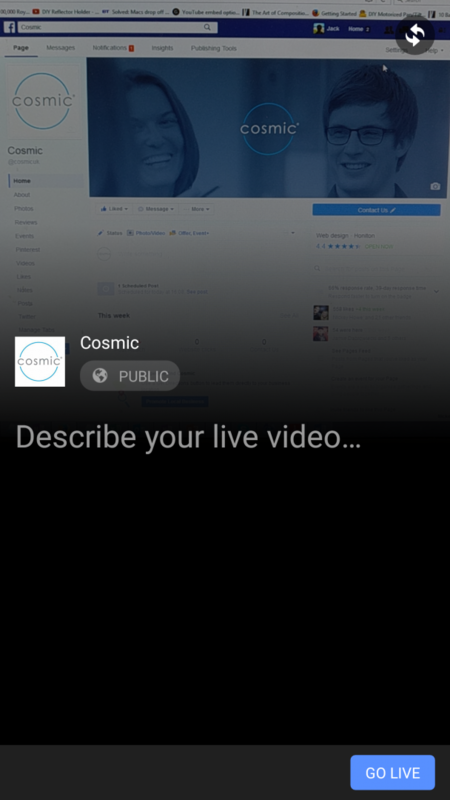 On this screen you will be asked to provide a description of your live video, to give people an idea of what the video will be about and also the option to use either the front facing or rear facing camera on your phone when the live stream starts. If you are choosing to live stream from your personal profile, you also have the option to change your live video from public, to only friends or only yourself being able to watch it. Using the "Only me" option is great to have a test run to make sure everything runs smoothly and rehearse what you want to talk about. When you are happy with your video description you are ready to go live. Press the "Go Live" button on the bottom right of the screen. After you press the Go Live button, you will have a 3 second countdown timer before the live stream commences. 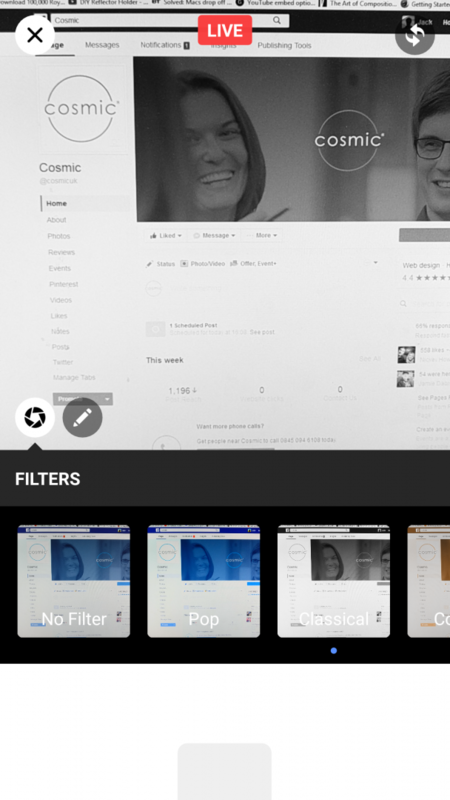 Once your live video is running, you have the option to use a filter on your video to add some effect, as well as the option to draw on the screen, which is great for highlighting certain areas that you displaying on your live stream. The top half of your live stream will show you what your camera is seeing, and in turn what anyone who tunes in to your live stream will be seeing too. 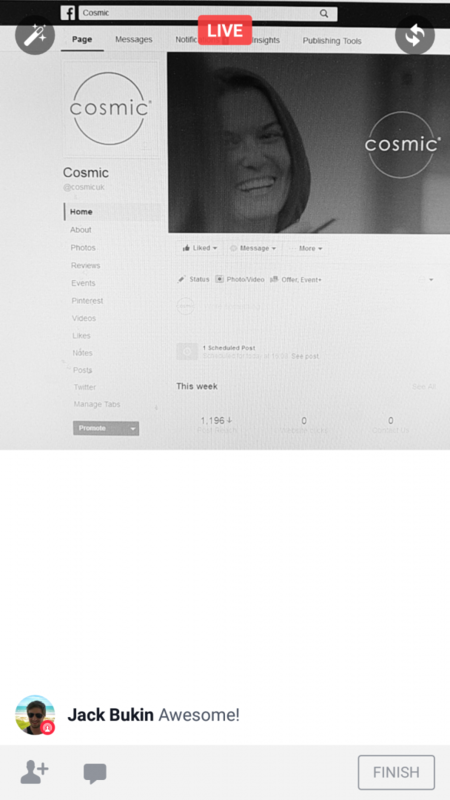 The bottom half will show you the comments and likes or reactions that any viewers post in real time with the video. Once you reach an end to your live stream, or have run out of things to say, press the "Finish" button on the bottom right hand side of the screen. You will then be taken to a new screen which will allow you to share your live video for anyone to be able to watch again. On this screen you have the option to choose whether you want to upload the video in HD or non HD. HD is great if you are connected to Wi-Fi, however if you have a limited data allowance and are using your mobile network to upload, then it may be best to choose the non-HD option to upload your video to Facebook. You can also download the video to your own device. This is useful for making a quick edit if needed using one of the many video editing apps available, or if you want to upload the same video to another platform such as YouTube or Twitter. Again, you can choose whether this video is shared publicly or to only a select audience on your personal profile. Once you are happy with your video you can either press "Post" to share it far and wide, or if you change your mind and wish to remove it all together, just press "Delete". Your live streamed video will then appear on your timeline for anyone to watch back again. And that is how you stream live video on Facebook!